Santase (pronounced SAN-tah-say) is a two-person card game that’s popular in Bulgaria. The Santase rules are a little tricky but, once learned, the game is highly addictive. The card game rules are similar to those used in 66, and an Austrian game called Schnapsen. Santase is a card game for 2 people. The goal is to be the first player to score 66 points. Or, if neither player scores 66 points, the player to take the final card wins. Remove the 2’s, 3’s, 4’s, 5’s, 6’s, 7’s, and 8’s from the deck. 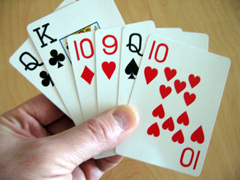 You will only use the 9’s, 10’s, J’s, Q’s, K’s, and Aces (24 cards, all suits). Deal 6 cards to each player. Flip over one card. That is the trump suit. Decide who goes first. After the first deal, the loser of the previous hand deals and the winner lays down the first card. At any point in the game, provided there are at least 3 cards remaining in the deck plus the displayed trump card, a player may close the deck. To do this, turn over the displayed trump card. You must do this at the start of your turn and you must be leading (laying down first). Then the game proceeds as in the “run-off”. There is danger in this play. If the player who closed does not score 66 points, the other player scores 3 points for the win.